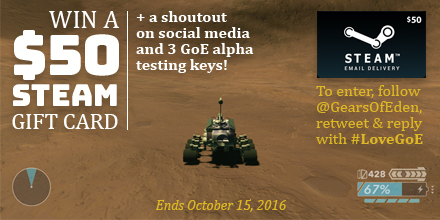 The prize is a 50$ Steam gift card, a shoutout on our social media and 3 Gears of Eden Alpha keys! Closing date for entries in the giveaway is 11.59pm GMT on the 15th of October 2016. In order to enter the giveaway, you must follow @GearsofEden, retweet the Giveaway Tweet and reply to it using the #LoveGoE hashtag. The winners will be chosen at random through Tweetdraw. The winners will be informed through Twitter direct message within 24 hours of the closing date and will need to respond within 3 days or new winners will be chosen in their place. The names of the winners will be made known on all Gears of Eden social media accounts. The prizes will be sent online via direct message or, by request, through e-mail. The contest is open to the general public age 18 and over, excluding employees and volunteers of Gears of Eden. Limit one (1) Submission per person via Twitter. Duplicate Submissions by the same person will be subject to disqualification. All terms and conditions of Twitter.com apply. Multiple entrants are not permitted to share the same Twitter account. Any attempt by any entrant to obtain more than the stated number of entries by using multiple/different Facebook or Twitter accounts, identities, registrations and logins, or any other methods will void that entrant’s entries and that entrant may be disqualified. Use of any automated system to participate is prohibited and will result in disqualification. In the event of a dispute as to any Twitter account, the authorized account holder of the email address used to register on the platform will be deemed to be the entrant. The “authorized account holder” is the natural person assigned an email address by an Internet access provider, online service provider or other organization responsible for assigning email addresses for the domain associated with the submitted address. Each potential winner may be required to show proof of being the authorized account holder. No automated entry devices and/or programs permitted. All entries, including Submissions, become the sole and exclusive property of the Sponsor and receipt of entries will not be acknowledged or returned. Sponsor is not responsible for lost, late, illegible, stolen, incomplete, invalid, unintelligible, misdirected, technically corrupted or garbled entries, which will be disqualified, or for problems of any kind whether mechanical, human or electronic. Only fully completed submissions are eligible. Proof of submission will not be deemed to be proof of receipt by Sponsor.